I yawned staring blankly at the airline crew doing the safety demo before taking off, I was on a 9pm flight for Manila. It’s a long Friday or a long week for that matter, and all I wanted was to curl up on my bed with my fluffy pillows. But I need to go, like a fish out of water my gills were severely dried up – it’s been nine weeks since my last dive! After a bus and ferry boat ride, we arrived a little past 9am at Sabang hoping to catch up for Isla Verde trip, but all boats have left already. 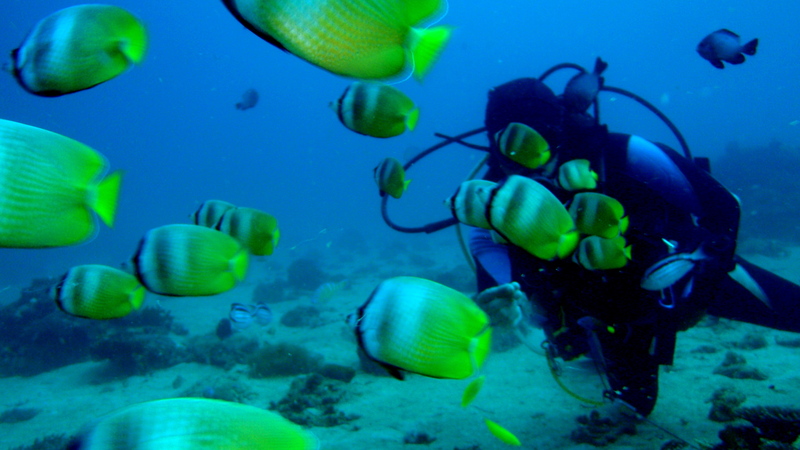 We ended up with the two remaining dives on schedule for the day within Sabang area. But just watching the blue waters and sunny skies, gave a spirit lift even with lack of sleep. Nine months ago, we feasted with the rich marine biodiversity within the nearby sites. A number of divers were book for the day, so DM Guy assigned us to the new speedboat of the resort with DM Andrew – Angel and I was glad they still remember us, later we learned that it’s rare they have Filipino clients, almost everyday they had foreigner divers from other parts of the globe! All other divers were indeed of different nationalities, we were joined with a Canadian. Our first descent was in Sabang Point planning for a maximum depth of thirty meters, rolling back for our entry I remembered what we did in Tubbataha complete with the count from our DM. We descend on sandy slope decorated with variety of hard corals coupled with juvenile reef fishes, floating and watching the sights in silence. It felt so good to be back in the waters! There were damsels, sand perch, a lurking moray, blue nudi and a slithering banded sea snake – instantly we back-out a little observing its direction. A little dragonfish was perched on sand, it was my first time to see this critter with such wing-like pectoral fins, I believed it was disturbed by our presence. Invertebrates abound in the area – colorful crinoids and hydroids. 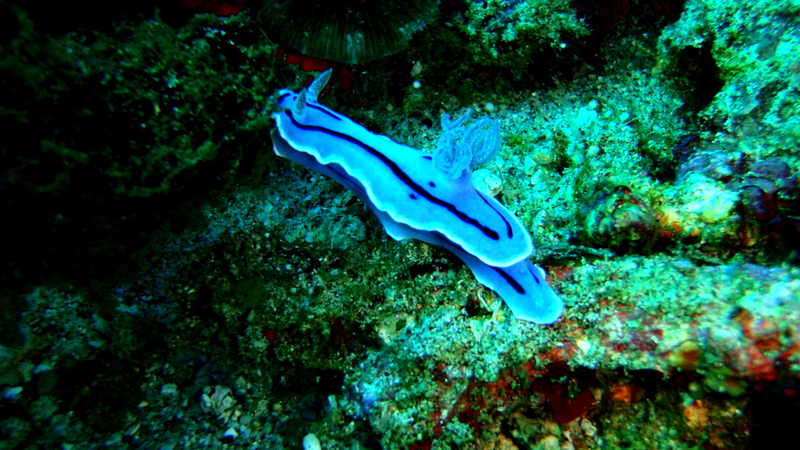 More nudi species, variety of anemone fishes, wrasses, anthias, damsels and more. I watched in awe a herd of yellow-tailed fusiliers hanging in mid-water, swimming in unison with same vibration in one direction. 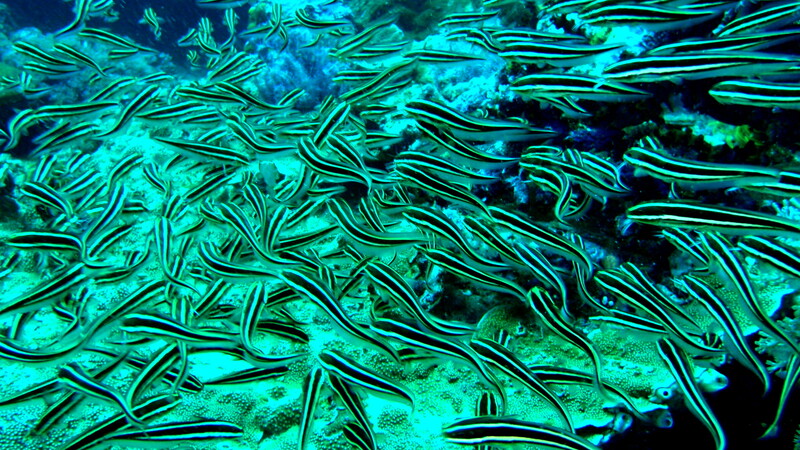 Then over lush corals, appeared another herd of striped eel catfish wiggling its way and further, a long crocodile houndfish inched its way near the hard corals. We hovered around a coral area for our safety stop until we ascend having a total bottom time of 51 minutes. DM Andrew briefed us that the next descent will be at Sabang Wrecks, I guess DM Guy was taking note that we love wrecks and so the suggestion. This time we are joined with three other foreigner divers. A short five minutes on the speed boat to the spot, back rolling again for our entry we went down on a sandy area. Our first encounter was a snake eel, with only its head protruding, its entire body buried on the sand – amazing! 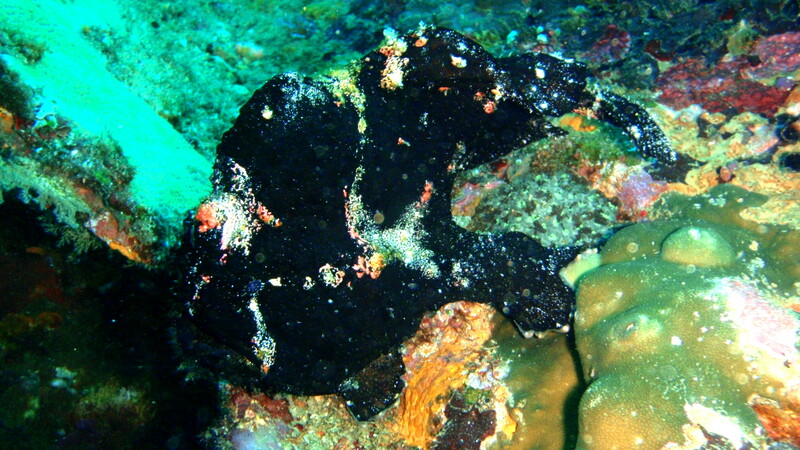 Very rare, since they are commonly seen on night dives. We passed a coral area as we proceed to the first wreck, a small boat almost rotten but a good artificial reef as there many fish species now claimed it as their abode. 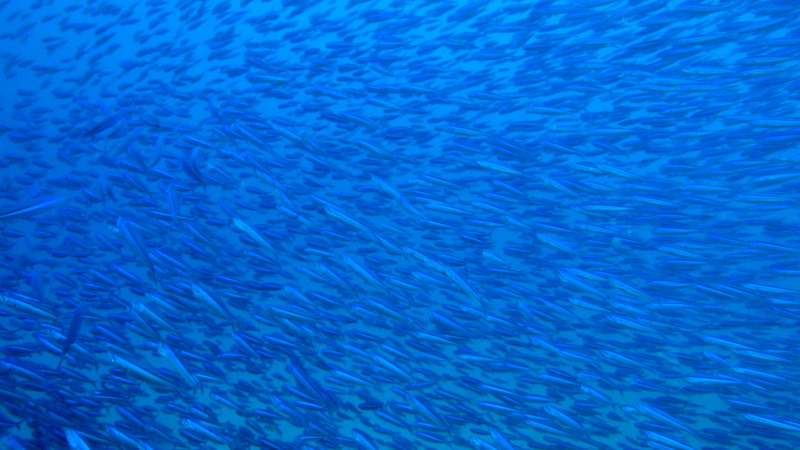 Juvenile fishes swarmed the area. On our way for the second wreck, a giant moray lurking under a coral appeared before us. 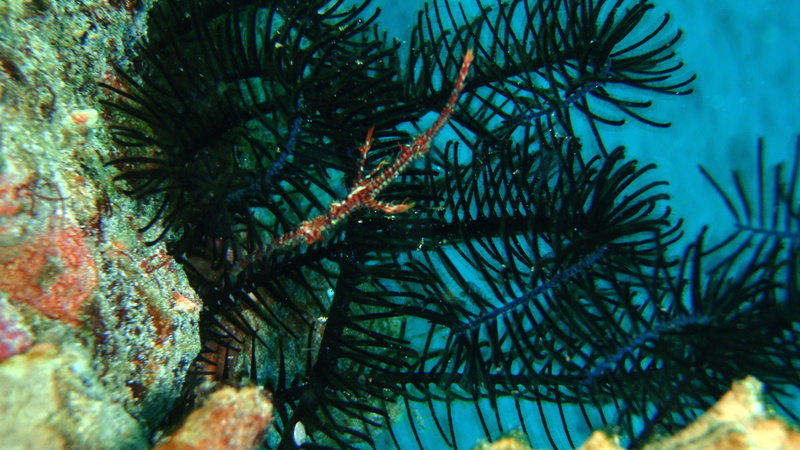 A patch of coral with crinoids on the sand housed a pair of ghost pipefish, mimicking the green feather star! Rare sighting, but the waters was disturbed when another came near, it went cloudy. There was a flounder – another rare sight, so elusive with its color like the sand but with eyes protruding, its outline appeared like an abstract. Angel wanting to take more photos, we finned back for the ghost pipefish at the deserted sandy area just in time when the visibility cleared up. Indeed, one need keen eyes to see more of the wondrous marine critters. beauty and wonder of the depths. We swam back shallower and passed over the first wreck which is more of a debris, unto the sandy area for our safety stop. Yet even with the last few minutes, we still had wonderful encounter with another moray, a troop of big yellow cardinals, peacock mantis shrimp and a group of pipefish. We ascend after 48 minutes bottom time with the afternoon sun still shining brightly. Coming to Puerto Galera was another buffet of marine encounters just like our last visit nine months ago, the two dives renewed my spirit without doubt and it was another marvelous weekend with my favorite dive buddy. We aimed for Verde Island but Sabang didn’t disappoint us, it gave us good reason to be back again to savor more of its diverse marine life. Long trip and lack of sleep didn’t stop us for the dive, it might be insane for some but ironically I need it to maintain my equilibrium. And I’m sure there will be more surprises in the depths in future trips to this booming town! NB. Photos courtesy of Angel using Olympus Tough 8000 with PT 045 as casing.